If this were any other movie, discovering the power to time travel would start our protagonist on a great journey of superheroics. Maybe she would find some horrible crime that needed solving, or perhaps she would track down the X-Men and try to join the team, or if nothing else, she would become the villain of the piece. She would at least do something with her power. But when high school student Mokoto Konno finds out she can leap backwards in time, the first thing she does is head back to yesterday so she can eat her pudding before her sister steals it. This basically sums up much of The Girl Who Leapt Through Time as Mokoto uses her amazing new power for the most mundane circumstances. The closest movie to compare this to might be Groundhog Day, but in that film reliving the same day over and over was a curse, while here Mokoto gleefully heads back to past moments to relive them or make them turn out better. She spends about ten hours straight at a karaoke bar leaping back whenever her time is up so she can start again. And when she comes home and finds that dinner isn’t the meal she was hoping for, it’s another quick hop to two nights before when they had her favorite. 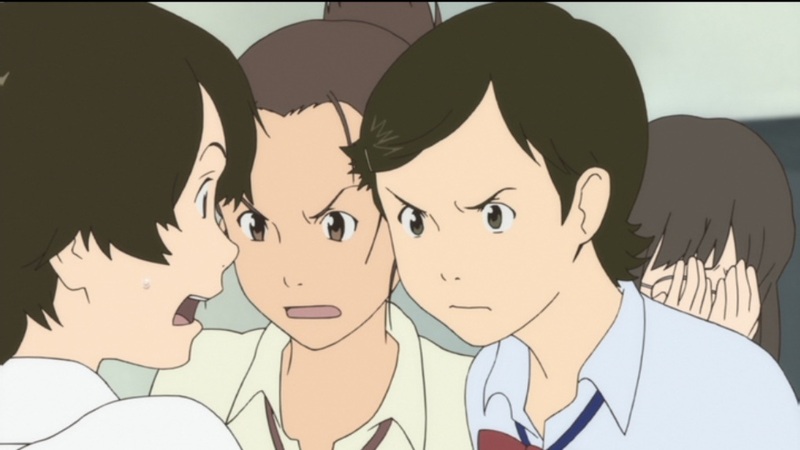 Where The Girl Who Leapt Through Time really shines is with its physical comedy. When time traveling, Mokoto must literally leap into the past. Her appearances are spontaneous and often leave her tumbling into random objects and situations. She becomes quite good at somersaulting, and you begin to wonder just how durable her skull is. I also started wondering just how long Mokoto crashing through things could still be funny, and the answer is at least the length of the film. There is always just enough variation on the theme to keep it unexpected and amusing every time. It’s not laugh out loud hilarious, but it gives just enough of a chuckle to keep the film from slogging down into boredom. It works so well, mostly because of the deadpan delivery. This is no Three Stooges or I Love Lucy. Mokoto appears, crashes through something, and the scene moves on with mostly realistic responses from the people involved. The ability to juggle straightforward drama with absurd comedy, instantaneously and without missing a beat, makes this movie a complete joy to watch. And there is serious drama here. As Mokoto begins to see the negative outcomes of her thoughtless time jumps, she attempts to fix them, often only making things worse. She juggles around the relationship between her best friends, two guys who may be secretly in love with her, or she with them. She’s not at all sure on either count, and both the guys have their own admirers elsewhere in school. She uses her power to duck and weave through social situations and avoid confronting her own feelings or those of her friends. Her jumping back in time is a perfect symbol of her unwillingness to move on with her life. The mechanics of how she leaps though time, though, is never really explained. She never meets herself in the past, and her clothes change to what she had on in the moment of time she returns to. Clearly she is not traveling through time, but undoing it instead, replacing the past version of herself and starting over. Where she appears seems to have no relation to where she was during either her starting time or destination time. So is she teleporting as well as time traveling? Does she age separate from her time travel? Can she only travel backwards, or does she just never care to see the future? There are probably a million different questions you could come up with, and none of them are answered in the film. All of it is unclear and unimportant. The story is about the effect her power has on her life, not the details of time travel. Despite the fuzzy nature of it, the plot comes to a climax where everything about the story, if not the science, comes together beautifully. It put me off at first because it shatters the whimsical mood of the film, but that is sort of the point. Mokoto must learn to move on and abandon her frivolous attitude. What really won me over, though, was its excellent coordination of all the various subplots and minor details that feed into the ending. It’s not perfect; there is one minor plot hole that mars the conclusion, but it wasn’t big enough to send the whole work crashing down. I’ll just have to consider it another of those unexplained quirks of time travel. I had a great deal of fun with this film, far more than I ever expected to. It’s easily one of the best anime films I’ve seen from this century. It’s charming and funny, and I think just about anyone who gives it a chance will enjoy it. Sounds like an awesome concept (aren’t time travel movies always ;)), so will add this to my to watch list. Nice review! You know, I have an instinctual mistrust of time travel stories I developed sometime in high school when every one I watched or read was crap. Ever since then I’ve been leery of them, but recently all the ones I bump into have been pretty good. Maybe I just ran into a bad batch or something. It’s always tricky to keep track of everything, and even this one can’t completely avoid small plot holes. Those things tend to bug me, so I generally avoid time travel stuff. If I could go back in time like that, I’d go back and stop Nigel Stephens from pulling my pants down in front of the whole class in Grade 4. Other than that, I’d just go back and bet on sports results – Biff Tannen had the right idea, man. Those are some good uses of time travel right there. I don’t know that they would make for an interesting movie, but they’re far more practical. 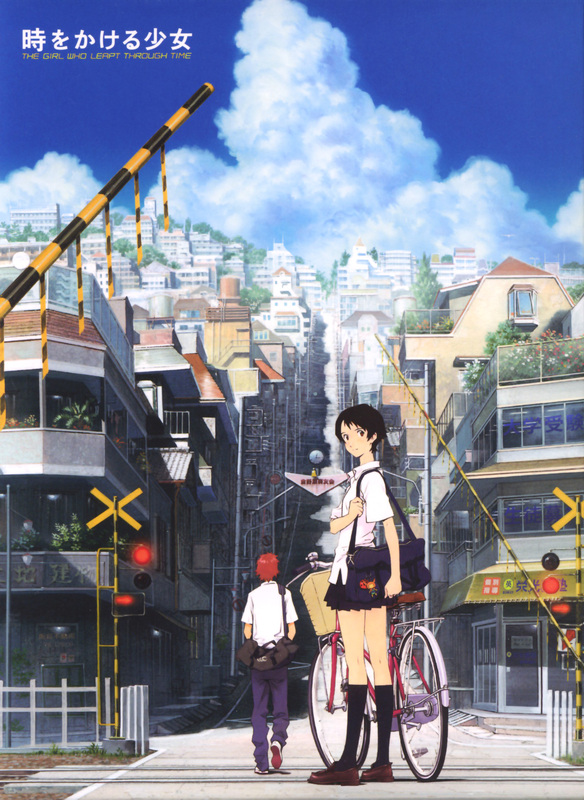 The Girl Who Leapt Through Time is easily the best anime movie I’ve seen. Makoto is such a likeable character and I agree that seeing her crashing into things remained amusing throughout, as did the reactions from her friends – especially at the karaoke place. I understand where you’re coming from with wariness regarding time travel, but have you seen Steins;Gate? I think it’s a fantastic series and the time travel aspect is executed really well. There’s a great post here about The Girl Who Leapt Through Time and Steins;Gate which is well worth a read! Well, I can think of a few better ones, like Howl’s Moving Castle, but this is certainly pretty high on the list. I’ve been wary of Stein’s Gate, though. My gut tells me it’s gonna be bad, and so far I’ve been listening to it. My gut has been wrong before, though. We’ll see. I also laughed every time she crashed and rolled into something. She smashes into them hard too! I think that exaggeration is what makes it so funny. For some reason it’s just fun to see her jump through time without any major threat on the horizon or event to stop. She’s just trying to get to class early and stuff. I did find the ending to be weaker than it could have been, mainly because of what I’m assuming is that plot hole you mention above. Still a very good movie overall, though. Cool, glad it won you over. It’s a lot of good lighthearted fun, and it’s surprisingly endearing. I wasn’t thrilled with the ending either when I first watched it. Something felt very off about it. I had to think about it for a while and in the end decided that it worked for what they were trying to say with the story. But, yeah, I can’t help but think it could have been done better somehow. Good review, my sentiments exactly. Pity the ending was a bit weak but the film easily more than held my attention throughout. Funny, exciting, poignant. A grand twist on rites of passage, teen angst and the Grounding Day scenario. Thanks! Glad you liked the review, and I hope you continue to enjoy them!